The fourth installation to the Samsung Galaxy Note series was announced this week, although, it is expected to hit the stores sometime in October. This announcement came after spirited speculation by mobile experts and the world markets on issues such as design, features, differences from its predecessors, and the price. This is quite an exciting time as Apple is also releasing its iPhone 6 bringing it in direct competition with the Note 4. There are numerous differences between Note 4 and iPhone 6; however, Samsung beats Apple in terms of the pricing, even though both manufactures rule the roost. 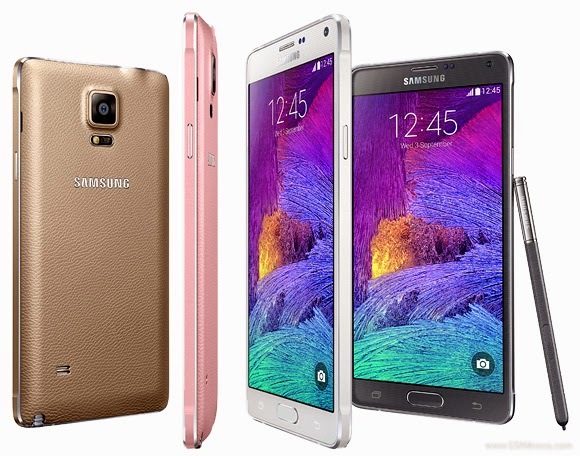 So, what’s in and what’s out as we move from the Note 3 to the Samsung Galaxy Note 4? The first impression is obviously derived from the design and the dimensions. In this regard, the Note 4 has retained the dimensions of its predecessor but has much more to offer in other areas. Let’s take a look at the features and check out what’s new. The display is a 5.7-inch Super AMOLED capacitive touchscreen with 16M colours. Its resolution is a cool 1440 x 2560 pixels with a pixel density of approximately 515ppi. The screen enjoys the protection of Corning Gorilla Glass 3, and has other features such as multi-touch. Long with exceptional display, Note 4 comes with a new multi-windowfeature that provides users an opportunity to multitask and save time. Samsung Note 4 owners can select how they access their apps and change the position and size of apps, whenever they want. The Note runs Android Kit Kat OS version 4.4.4 on a Qualcomm Snapdragon 805 (SM-N910S) Exynos 5433 (SM N910C) chipset, and a CPU featuring a Quad-core Krait 450 clocked at 2.7 GHz, 1.9 GHz quad-core Cortex-A57, and Quad-core Cortex A-53 clocked at 1.3 GHz. The RAM is an incredible 3GB, which is supported by an internal storage of 32GB and external microSD support of up to 128GB. The new processor, RAM, and space combination creates a superior experience that is the envy of any multi-tasker or gamer. Both the cameras of Note 4 are more enhanced as compared to its predecessor Note 3. The 16MP primary camera has a resolution of 3456 x 4608 pixels along with autofocus, optical image stabilization, LED Flash, Dual Shot, Simultaneous HD video and image recording, touch focus, image stabilization, panorama, geo-tagging, and HDR. It also features optical stabilization and dual recording for video recording. The secondary camera has 3.7MP, which is way better than what most phones have. Samsung, with this model, has sent a loud message to the competitors and the market alike that it is driven by innovation, customer satisfaction and producing smartphones that actually work.